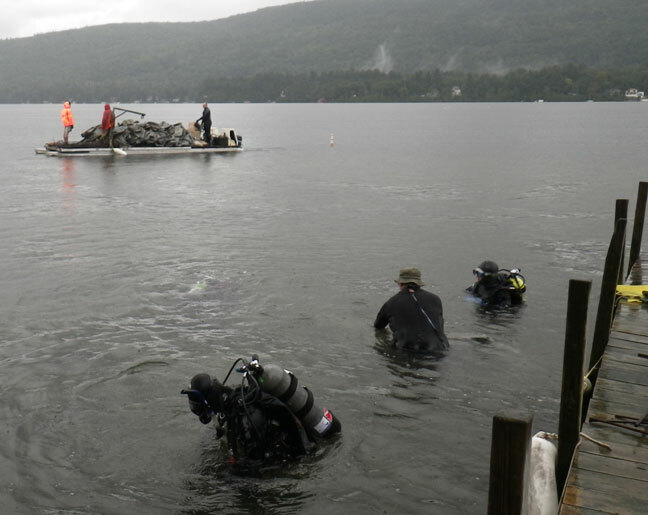 Last week, divers from the Lake Champlain Maritime Museum again made the trek to beautiful Lake George to assist the FUND for Lake George in their Asian Clam eradication project with funding from the Lake Champlain Basin Program. Our job this time is to recover the rebar and sandbags and mats that have been smothering the little clams for the past couple months. 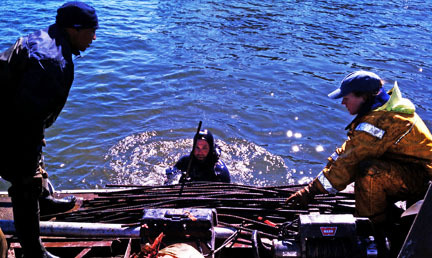 LCMM divers (foreground) pull rebar and mats for loading onto the work boat. Photo by LCMM. Moving rebar onto the work boat. Photo by FUND for Lake George. All of this material gets dropped off on shore and sorted into piles. The rebar gets moved to the FUND’s off-site facility. The mats are dragged out, fully extended, and folded neatly and placed in a trailer. We attempt to take turns, though the surface folks have the worst job. Okay, let’s look at the numbers. Each mat is a 20mm-thick sheet of PVC (like a pool liner) 50 feet long and 7 feet wide, weighing around 45 pounds. Each mat is held down by 30 5-foot pieces of No. 4 or No. 5 rebar, and sometimes a few sandbags. Each piece of rebar weighs approximately 5 pounds. Each sandbag is around 40 pounds. So to recover each mat, we lift 275 pounds of material at least three times. 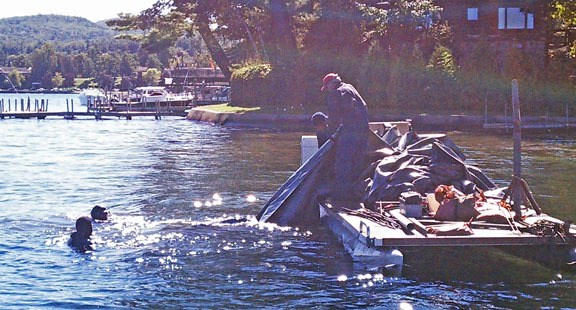 When we arrived, there were 725 mats at the bottom of Lake George. Good grief. Pulling a mat out of the water onto the barge. Photo by FUND for Lake George. And there’s more bad news. This summer, three other infestations of Asian clams were discovered: in Treasure Cove, Boon Bay, and Norowal Marina in Bolton Landing, as far as 9 miles away from the original colony. As more information is gathered – including surveying the lake for additional infestations – planning is underway for treatment options. We’ll be returning next week to continue this important work. Want to volunteer? Contact the FUND for Lake George: 518-668-9700, info@fundforlakegeorge.org. Among the many organizations supporting the FUND for Lake George, we met folks from the Lake Champlain Basin Program, the Darrin Freshwater Institute, Adirondack Park Invasive Plant Program, and Bateaux Below.